In Yemen, the dramatic spread in cholera has presented life-threatening risks to pregnant women and their unborn babies. For obstetrician-gynaecologist Diana Wellby, recently returned from Taiz, the response entailed a completely new aspect of maternity care. 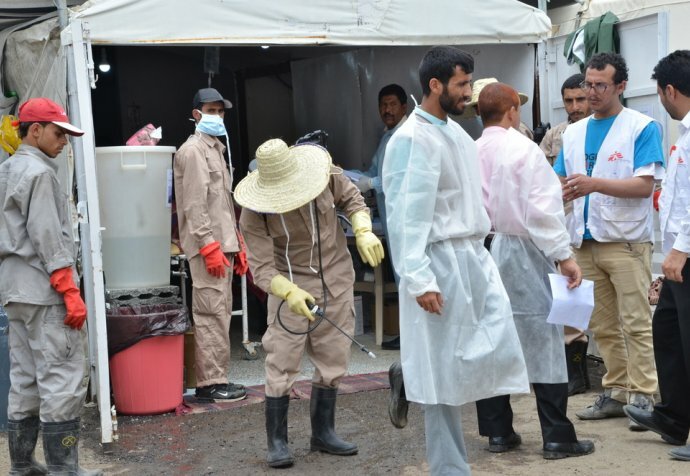 “The cholera epidemic was just starting and the Médecins Sans Frontières Taiz hospital set up a dedicated cholera treatment zone in the hospital about four weeks after I arrived. It soon became apparent that treating cholera patients who were also pregnant is complicated, and it was essential to keep the cholera treatment (CT) zone as separate as possible from the rest of the hospital, and to keep the number of persons moving between the two areas as low as possible, for the obvious reason of minimising the risk of spread. We moved the CT zone off-site, and we kept the patients who were pregnant in a new isolation area in a downstairs room in the hospital. The team ran this small ward of six beds. Sometimes it was overfull, and at the height of the epidemic we needed to add three beds. The danger posed to the foetus was gravely evident from the first few days of treating patients. Of the first 13 patients admitted we had three who experienced early miscarriage, and a staggering five other women in their final trimester whose foetuses were dead in utero. The scant available literature suggested that the likely causes of these deaths were a combination of dehydration, acidosis (excessive acid) and hypoxia (oxygen deficiency). Our only tools were early treatment and rapid, adequate rehydration. When patients are admitted with cholera (pregnant or not) an important assessment is the degree of dehydration, graded into mild, moderate or severe. As our pregnant patients were faring so badly in the area of foetal loss, I immediately made the decision to treat the pregnant women as one grade higher than their clinical assessment of dehydration level. So we were treating most of them with intravenous rehydration instead of orally. It is too early to make solid conclusions, but we did see a dramatic drop in foetal loss on this more aggressive treatment regime. "Our only tools were early treatment and rapid, adequate rehydration"
A version of this story first appeared on the Medical Observer website. Read the original here. Cholera in pregnancy, and the risks for women and the babies they are carrying is not well documented. As an organisation, Médecins Sans Frontières has gained some of its most extensive experience in Haiti after the earthquake in 2010, where it established “cholernity” wards to combine cholera treatment and maternity care. However, there remains a lack of hands-on experience worldwide in this specialised area.